Why another Haggada? Rabbi Shmuel Goldin, former president of the Rabbinical Council of America, renews the traditional guide to the Passover Seder service with his emphasis on the big picture. What is the Seder really all about? What are the overall goals of this richly textured service? How does the Haggada, step by step, enable the realization of these goals? What are the connections between each paragraph of the Haggada and the next? Why do the rabbis structure the evening as they do? Rabbi Goldin addresses these and other fundamental questions in a clearly defined journey of learning that reaches from the dawn of Jewish history to today’s Seder table. 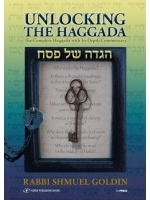 In language and style that will appeal to any reader, from the scholar to the novice, this new Haggada takes each Seder participant by the hand along the steps of this extraordinary journey. Here then, a Haggada for the ages, certain to enhance the Seder experience, in home after home, year after year.